Some company or school networks don’t allow you use instant messengers by using their firewall to block certain port numbers that prevents application such as Windows Live Messenger, Google Talk, ICQ, Yahoo! Messenger and AOL Instant Messenger in connecting. Even if you’re on a network that does not block instant messengers, you still need to download and install the program on the computer. You need to make sure that the password is not saved on the public computer or else the next person can use your account. If you need to urgently connect to an instant messenger service to send a quick message without all the hassle, the easiest way is to use web based instant messenger. They will work unless the URLs are specifically blocked on the firewall rules. The web-based ICQ messenger is now called Web-ICQ instead of ICQ2Go! 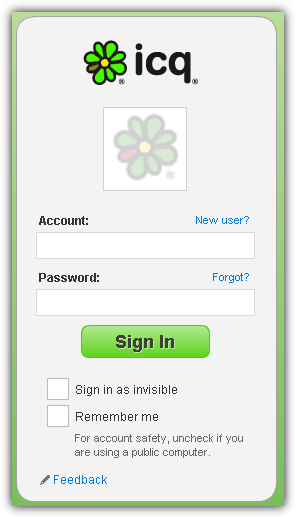 It runs on Flash and just click on the huge Launch Web-ICQ button to open a new window to login to your ICQ account. The web-based Yahoo! Messenger has been integrated into the webmail. You will need to login to your Yahoo! Mail and you will be automatically logged in to messenger. 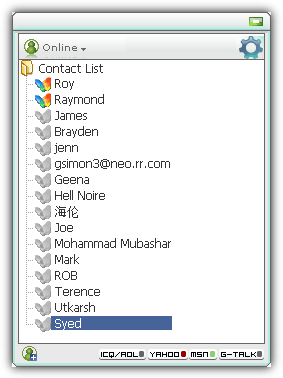 Your online contacts will be shown at the left hand sidebar where it either shows Top Contacts or Online Contacts. Double clicking on the contact will popup a window for you to start chatting. 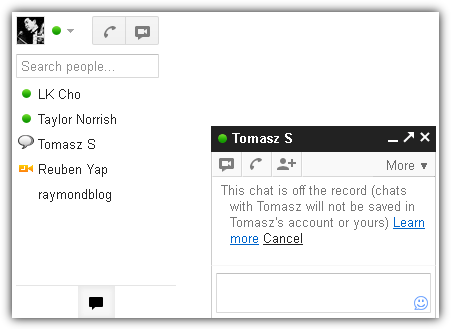 Similar to Yahoo Messenger, Google Talk is also integrated into their email service Gmail. After signing in to Gmail, there is a chat icon located at the bottom left and clicking on it will show your online contacts at the left sidebar. It is even possible to start a voice or video chat by installing a plugin. 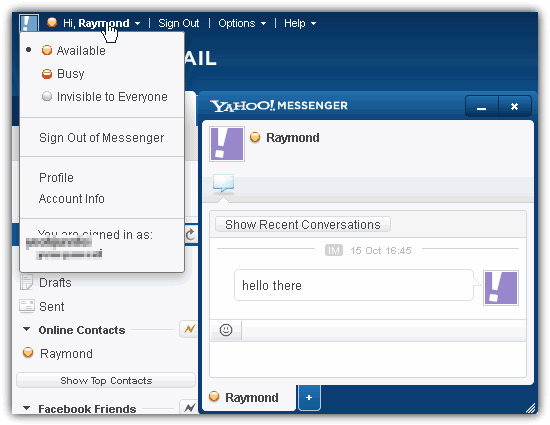 The web based Windows Live Messenger has been recently integrated into the new Outlook.com, previously known as Hotmail. 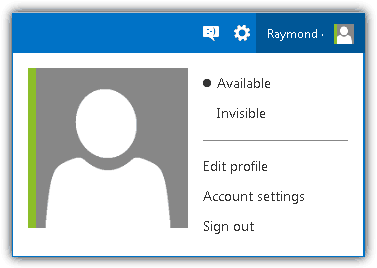 After logging in to Outlook, you can click on your name that is shown at the top right to change your status. To chat with your contacts, click on the chat icon, then click on the Start New conversation box where a drop down menu will display your online contacts. 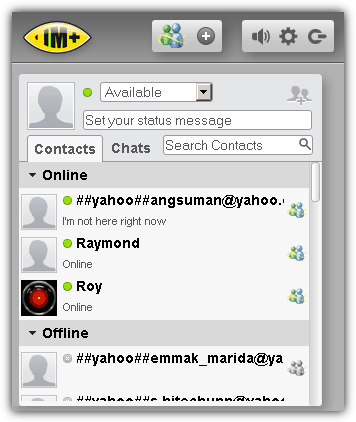 AIM Express is the web based version of AOL Instant Messenger that runs on Flash. Click the Chat Now button, and login with your AOL account. It also supports integration with Facebook Chat and Google Talk so you can directly talk to your contacts on other networks right from AIM Express. All the above websites are official web based instant messengers. There are also third party websites that provide all in one web based instant messaging. If you’re afraid to login to your instant messenger account on third party websites, you can use the official ones instead. With Meebo retiring their online messenger, here are the alternatives. 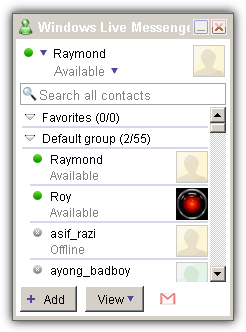 Trillian is a popular multi instant messaging desktop shareware that connects to most available messaging service. This allows you to chat with your contacts from one program rather than installing and running multiple programs. They now have a free web based version where it requires you to create a free account, and then add the service that you want to connect to. 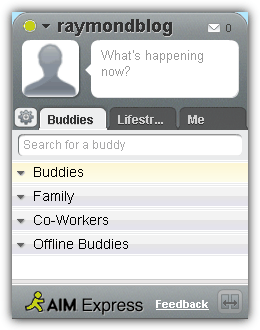 eBuddy supports logging in to MSN, Yahoo, Facebook, Google Talk, AIM, ICQ, MySpace and Hyves networks. A very nice feature found in eBuddy is the ability to add multiple networks and link them into one. imo is pretty impressive because it supports extra services such as Skype and Steam. The website uses SSL encryption that protects your login information from being stolen through packet sniffing. A unique feature found in imo is the ability to send short voice messages to your contacts. IM+ also uses SSL and support a lot more networks including Russian ones such as Yandex and Mail.RU. You can directly use it without registering an account but having an account has an advantage of auto signing in to multiple networks that you add without manually logging in each time. 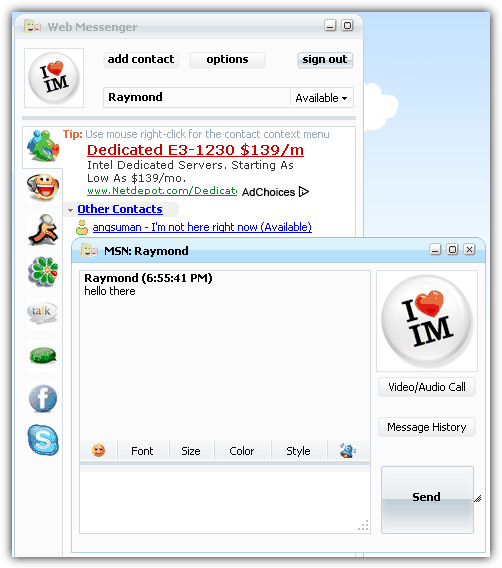 ILoveIM is another web based multi messenger that has been around for a few years already. Most of the major messaging networks are supported but one thing we didn’t like about it is an advertisement at the top of the template that pushes the contacts slightly to the bottom. 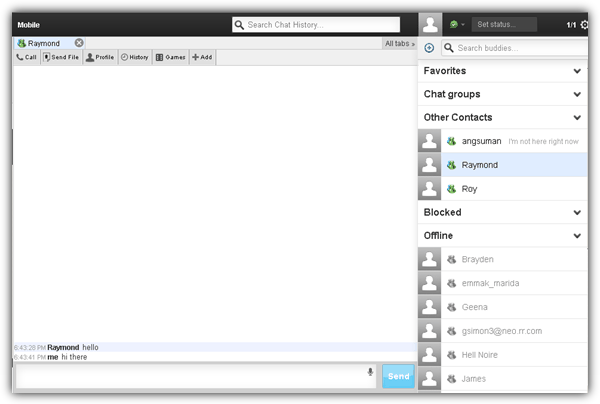 Nevertheless it is still a very good web based messenger with video/audio call support. Instan-t Express supports only 4 networks (MSN, Google, ICQ/AOL, Yahoo) and it has a very simple interface. During testing we were able to connect to MSN but not Yahoo. Although there’s nothing much to rave about but it is a good alternative in case most of the web messengers are blocked.